‘Tis the season for baking, so why not combine it with a cooking contest? 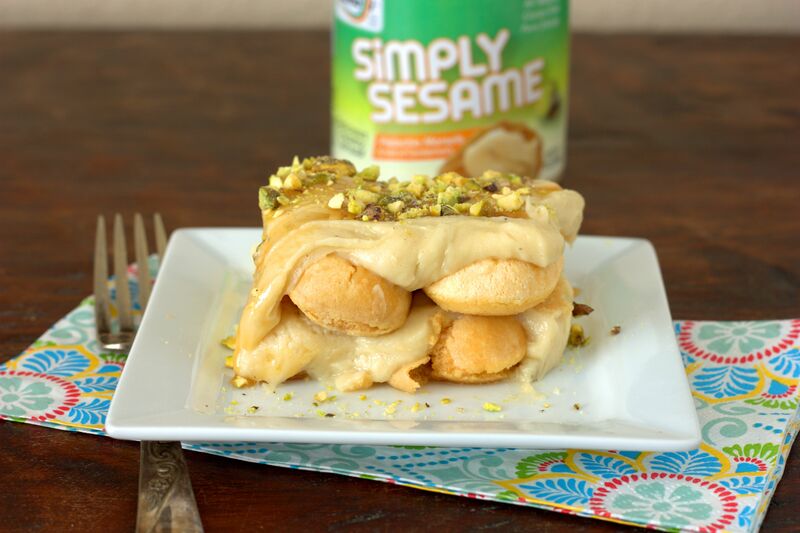 This week’s recipe was inspired by the Simply Sesame Blogger Recipe Challenge hosted by Simply Sesame. Simply Sesame sent me their three different flavors of Simply Sesame spread: Pistachio-Cardamom, Vanilla-Almond, and plain. I instantly gravitated toward the subtly exotic pistachio-cardamom (though I enjoy all of the creamy flavors) to make my Pistachio Chai Tiramisu. The other great thing about these spreads is that they are gluten free and peanut free. Tiramisu is an Italian dessert which typically consists of ladyfinger cookies soaked in a coffee-rum mixture and layered with a mascarpone cream layer then dusted with chocolate. For this recipe I decided to play on the cardamom flavor of the Simply Sesame spread and soaked the ladyfingers in a chai-brandy mixture. Next, I folded the pistachio-cardamom simply sesame spread into the mascarpone (along with a bit of powdered sugar) to create my creamy layer. 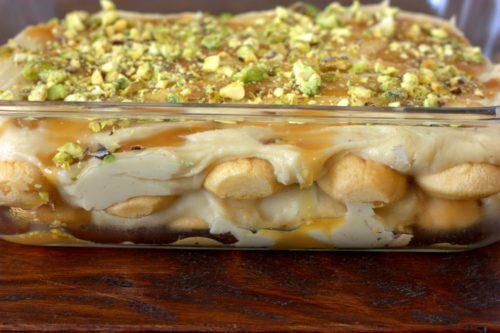 Finally, the top of the tiramisu was decorated with a bit of caramel syrup and crushed pistachios. The result was a beautifully presented tiramisu unlike any you have tasted. It received a thumbs up from my hubby who is a tiramisu aficionado. I hope you enjoy it just as much! Looking for even more sesame spread recipe ideas? 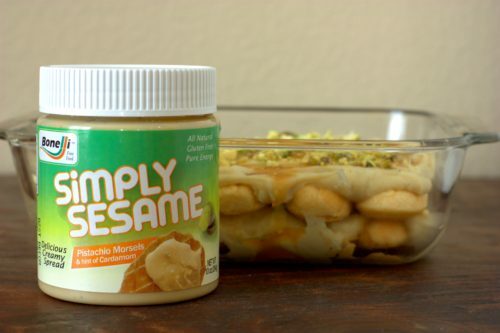 Follow Simply Sesame on Twitter, Instagram, or Facebook. Place the chai tea bag in the boiling water and let steep for 3-5 minutes; set aside. While the tea is steeping, prepare the cream filling. Add the mascarpone cheese to a standing mixer bowl along with the powdered sugar. On low speed, stir until combined. Add the Simply Sesame Pistachio-cardamom spread to the mixing bowl and mix on low speed until combined. Finally, stir in 2 tablespoons of the brandy until well mixed and set aside. Remove the tea bag from the water and place the tea in a shallow bowl along with the remaining 2 tablespoons of brandy and stir to combine. Dunk the ladyfingers in the chai tea mixture one at a time, 2-3 seconds per side and place in the bottom of an 8 x 8 dish or trifle dish (you should only need half of the cookies to cover the bottom of the dish). Spread half of the mascarpone mixture over the ladyfingers, then add another layer of the soaked ladyfingers on top. Spread the remaining mascarpone mixture over the top to coat the cookies (you should have two layers of cookies and two mascarpone layers). Refrigerate until ready to serve, at least 2 hours. Just before serving, drizzle the top of the tiramisu with the caramel syrup and then evenly cover the top with the crushed pistachios. 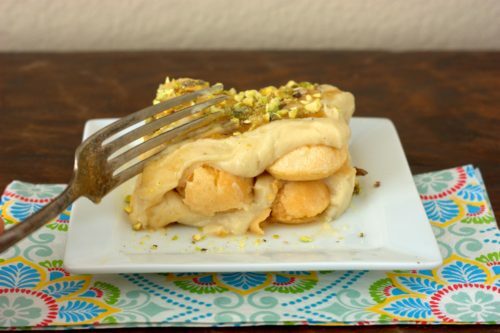 Cut and serve the pistachio chai tiramisu.